Recently WWE Hall of Famer and legend Mick Foley posted a picture on his Twitter account where he revealed a superstar who could become the WWE champion in the near future. Mick Foley is one of the best WWE superstars of Attitude Era. He won the World Championship three times during his career and was also involved in rivalries with superstars like The Rock, The Undertaker and Stone Cold Steve Austin. Last week on Raw, he returned to the ring to celebrate the 20th anniversary of his famous Hell In A Cell match against The Undertaker. He also revealed that he will be the Special Guest Referee for the match between Roman Reigns and Braun Strowman for the Universal Championship. Foley interrupted Elias who was performing another guitar segment and when he broke the news, Elias was unimpressed and told the Hall Of Famer to "shut his mouth". However, because he was a former General Manager of RAW, Foley was given special permission to announce one match for the night. He then announced a main event match between Finn Balor and Elias for RAW. 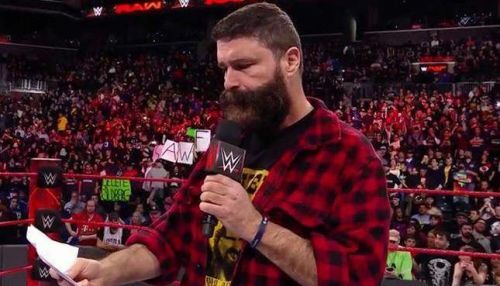 Recently, Mick Foley posted a picture on his Twitter account where he revealed that Elias will become a future WWE Champion. Through his post he also said that he enjoyed himself while walking with Elias. WWE Hell in a Cell will take place in the San Antonio, Texas on September 16th. Foley is going to be the Special Guest Referee for the Universal Championship match between Roman Reigns and Braun Strowman. and he can also play a big role on the outcome of this match. Do you think Elias will win the WWE Championship in due time? Have your say in the comments below.